Beautiful You: My Top 10 Products For Summer! My Top 10 Products For Summer! As the weather is getting nicer recently I am branching out into wearing some different make-up; lighter foundation and brighter colours. I thought I would share with you my top 10 products that are a must have for me during summer! They range from sun care, to perfume to make-up products so I hope you enjoy seeing what I use in the summer, let me know in the comments what you use. 1. Urban Decay Make-Up Setting Spray- this is an absolute gem in the summer, I hate it when you do your make-up and it looks really nice and then you go out and the sun melts it off. This product is perfect for stopping that exact problem, it sets your make-up and helps it last all day long, I cannot fault it! 2. Hawaiian Tropics Suntan Lotion- everyone has to wear sun tan lotion in the summer and I cannot beat this one, it smells amazing and protects my skin at the same time. I used this on holiday and it always reminds me of being back there and I love it! 3. Soap & Glory Heel Genius- I don't know if it is just me but I have to have nice feet in the summer as you have your feet out. I have started to use my mum's micropedi which is an electrical foot exfoliator and it works magic. I use that and then I apply this foot cream and put socks on overnight and in the morning they are so soft. 4. Hawaiian Tropics After Sun- again like the sun cream, I have to use after sun if I have been in the sun. I also started using this when I was on holiday and it just reminds me of summer and I cannot get enough. It literally smells amazing! 5. Benefit's Big Easy- in the summer I like to use a lighter coverage foundation and this is perfect. It is a liquid to powder formula makes it brilliant for when your travelling as you only have to have one product and not several! It comes in a range of colours that blend to your skin tones which is another plus. 6. Bourjois Bronzing Primer- this is brilliant for summer, apply it all over your face under your foundation and it gives you a summery glow. I also use this as a slight cover up when I have a tan because that's when my skin is at its best! 7. Babylips- you cannot protect your lips enough in the summer and I love the baby lips range. They are really hydrating and they also have some with sight tints so when you want to have a splash of colour without using a lipstick; these are perfect! 8. MAC Lipstick; Coral Bliss- I love an orange lip all year round but during summer I wear it basically everyday! This particular one gives you a splash of colour that isn't too over powering which is perfect for everyday. 9. Ralph Lauren No2- this is definitely my go to summer fragrance, it is light and fruity and I love it so much. If your out and about go and smell this because it's amazing. 10. Magicool- this isn't in the picture but who can go a whole summer without using this stuff? I love it when you are just too hot and a spritz of this and your good to go! Those are all of the products that I love using in the summer so I hope you enjoyed seeing them and let me know in the comments what you love to use in the summer! I will be back on Friday with another post and then there will be a bonus on Saturday as it is the launch of my YouTube channel! I hope you are all subscribed and as excited as I am! That MAC lipstick looks gorgeous! And I love the babylips range too! You should try the revlon lip crayons if you haven't already. They have such lovely colours, I want them all haha. What a lovely collection of products! 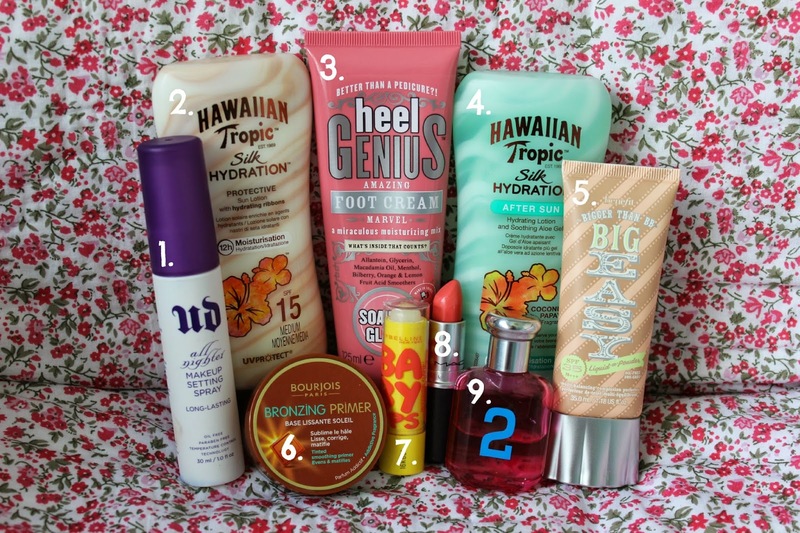 These are all my favourites for holiday too:) lovely post!